The fifth edition of Kwani? Litfest, a biennial gathering of writers, artists and thinkers from across Africa, takes place from 1st- 6th December 2015. This year’s literary festival, Beyond the Map of English: Writers in conversation on Language hosts readings, performances and discussions that explore issues of language and how this relates to African experiences and writing on the continent. 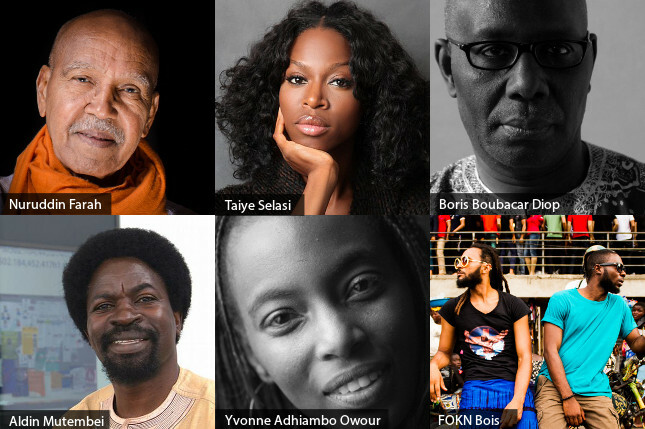 Confirmed participants include Nuruddin Farah, Taiye Selasi, Boris Boubacar Diop, Yvonne Adhiambo Owour, Wu Ming, Prof. Aldin Mutembei, FOKN Bois and Siphiwo Mahala. The Kwani? Litfest will also launch the East African edition of Nuruddin Farah’s book, Hiding in Plain Sight, a novel set in the wake of a terrorist attack that kills a Kenyan UN worker in Mogadishu, published by Kwani Trust. The festival features public lectures by Mr. Farah, Ghanaian and Nigerian novelist, Taiye Selasi, Senegalese writer, Boris Boubacar Diop and Tanzanian scholar and novelist Prof. Aldin Mutembei. The latest issues of the Kwani? Journal, Kwani? 08, is also set for release during the festival. A book party featuring the Ghanaian music group Fok Bois will introduce this issue, featuring work on the 2010 Kenya constitution, the 2013 general elections and devolution. Featured writers include Paul Goldsmith, Okwiri Odour, Laura Fish, Jackie Lebo and Ngala Chome. Over the past few months, Kwani Trust has been working on a collection of narratives from the Coast and Northern Kenya regions. During the course of this work, we have found that issues around the relationship between Western-oriented creative writing, up-country English-language publishing dominance and the use of Kiswahili at the Coast to warrant a special session at the Kwani? Litfest. Therefore, writers from the Coastal region will feature prominently on programming. Through a partnership with Mabati Rolling Mills, we are also thrilled to host the winners of the inaugural Mabati-Cornell Prize for Kiswahili Literature, who will be announced at the festival. The litfest opens with an African language symposium on Tuesday, 1st December. Further details will be provided through public circulation of the programme before the festival. About Kwani Trust | Established in 2003, Kwani Trust is a Kenyan based literary network dedicated to developing quality creative writing and committed to the growth of the creative industry through the publishing and distribution of contemporary African writing, offering training opportunities, producing literary events and establishing and maintaining global literary networks. Our vision is to create a society that uses its stories to see itself more coherently. On a related note: Binyavanga Wainaina is not only an important writer and activist in and beyond the field of contemporary African literature but also one of the founders of Kwani Trust. He suffered a stroke in October and his family are now trying to raise the funds needed for his medical treatment. Find more information and details of how to contribute here.